In the Florida Keys on US-1. Exit mile marker 48 at Marathon. On base. Active, National Guard, Reservists, Retired, 100% DAV, GS/NAF personnel. Accepted for RV sites, required for Cottages. Reservations must be made online at the provided web link. No pets in cottages. Pets must be walked OUTSIDE of the station perimeter. Usual leash and clean-up rules. Cottage rental rates depends on rank (see application). 12 day limit on cottages. 14 day limit on RV spaces. BBQ Grills, Volleyball, Water Sports, Diving. We spent 11 nights (4 nights on site 2 then several weeks later 7 nights on site 4) with W/S/E-50 Amp in a 38 Ft. Class A Motorhome. This secured installation is just off of U.S. 1, but the short distance between gate and roadway left our tow vehicle hanging out in traffic while waiting for the gate to be opened. There’s no office for checking-in, rather an individual comes to you with registration paperwork. There are 4 grassy sites varying in length and width with a small concrete patio and composite picnic table. The Wi-Fi was adequate during our first stay but poor the second stay. AT&T Cell phone reception was good. We had no problem using our Dish Tailgater for TV programs but was unable to receive any programs via antenna TV. The installation is small and comfortable and has a laundry available in a storage shed with free use of a single washer and dryer. However, the washer took 53 minutes to run a full-cycle and clothes were still damp after 60 minutes in the dryer prompting us to take them to the laundromat directly across the street. Despite the laundry issue, this is a very nice place to stay and we would definitely stay here again. We were lucky to have rented two cottages for my entire family who really enjoyed our stay. The cottages were clean and comfortable and came equipped with everything we needed. There were concrete picnic tables and charcoal grills available at each site and we could fish off the sea wall at a designated fishing area. There is a laundry facility on site but no commissary for groceries and ice. Not a show stopper though because this location is very close to just about everything. Each cottage is limited to parking only one vehicle, so we had to find off site parking for one of our cars. Coming in/out of the gate was a little inconvenient but happy we had the security of the USCG station. The rental boats were out for repair so we rented one elsewhere for two days which proved to be a little pricey. Rick and the other caretakers were outstanding. They provided suggestions for restaurants and other places to visit, gave directions, and made sure we had our supplies. All were very pleasant and approachable! Overall - we loved it and will return!!!! Lucked out and got in for 4 days in High Season. 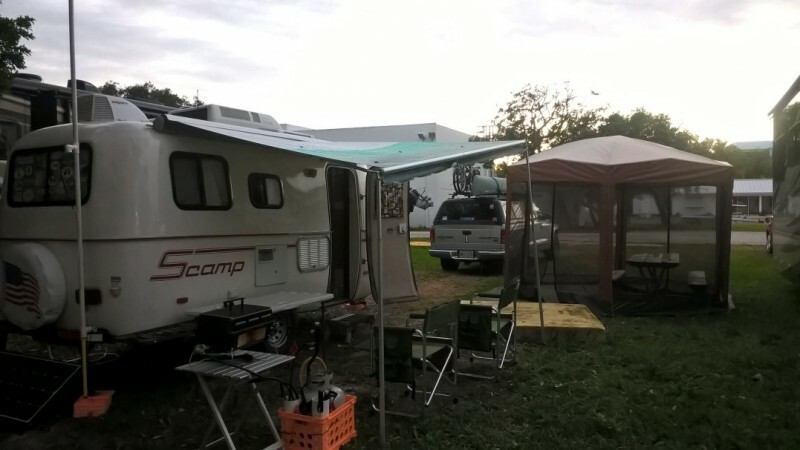 Just 4 RV sites that are in desperate need of upgrading but overall a good value at $30 per night while our friends (non military) stayed south of 7 mile bridge for $120 per night. This is actually a well kept secret for the most part. Manager and CG members were very cordial and accommodating. The biggest inconvenience was getting in and out of the gate and curfew but security considerations were worth it. We will go back for a longer period because the fees and location are great. Left a day early due to bad weather but again, well worth the trip. We made reservations last year for spot 1. This is the best of the four as you are not facing your neighbor and do not have a sewer at your patio. Last year in this spot you would have had a nice bay view, this year the view is of parked boats and FWC trucks. Wake up call this morning was at 0500 due the FWC activity 20' from my window. The sites are essentially mostly level grass with a broken concrete pad. All 4 sites are full hookup. Wifi is free, as with the majority of free wifi systems it ranges from as good as nothing to slightly better than nothing. We used it as long as we were not doing much, if we needed to write a review, search for a restaurant, we would use the Verizon broadband. Laundry is free and in good shape. There are no amenities here other than laundry. Walking, biking, and all other activities are off Station. The Station also has a cerfew so you are limited in the ability to come and go. Walking and biking from the Station is along a very busy and noisy highway 1. Car is necessary. We enjoyed our two weeks but next year will skip Marathon and spend more time at Manatee Cove and NASKW. As directed we called before arriving, told Rick we were 15 miles out, gate was closed no one in sight, so went on down turned around, tried calling again got recording. Pulled up to base stopped in the street as its 4 lane, called # on gate , they opened the gate ! No problems in or out since ! Site is grassy, level, and plenty big enough for our Montana Mountaineer 37 footer. Very hot, humid but to but to be expected here in August! Went to breakfast at the "Stuffed Pig" great food !just up the street ! Came back to find several Iguanas wandering around the grounds! Not aggressive, would run away (the Iguanas) when I tried to get closer for a better picture. Nice place, central to the rest of the keys ! You won't regret your stay here! We were going to be in FL in Feb and just happened to check to see if any of the 4 sites were available while we were in FL. We got lucky and got site 2 for 4 nights. 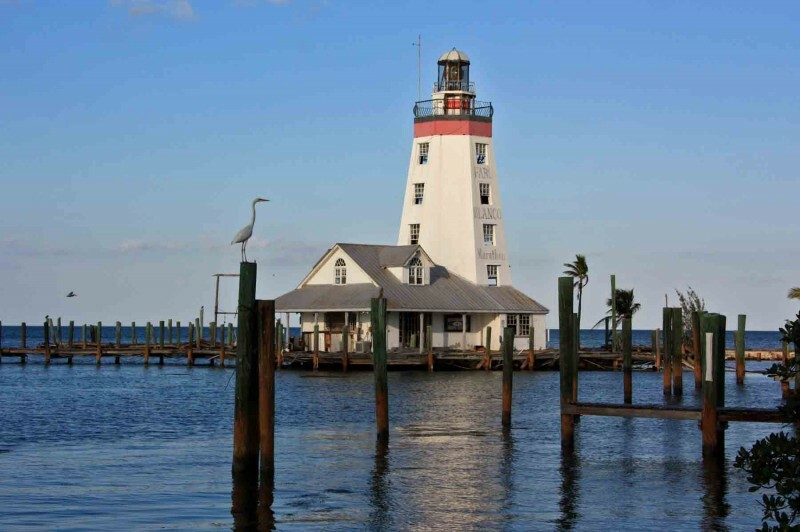 Marathon is a great central location for visiting the keys. We got a FL state park pass and spent a lot of time visiting the state parks nearby. Our neighbor in site 3 mentioned that FL provides free lifetime state park entry passes to Veterans with a service connected disability, and I happened to have a copy of my VA letter on my phone, so we got one the next day and that gave us free access to visit the state parks. Key West is only an hour away so it's an easy day trip. You definitely need to be self contained since there are no restrooms available, but they do have full hookups. They do have a free washer and dryer next to the cabins, and we had no problems with using them when we wanted to. I was concerned about the gate entry procedure but it turned out to be fast and easy. I called the caretaker number a couple hours before we arrived and Rick met us, showed us our site, and got our paperwork completed. You still have to call a phone umber when you arrive at the gate for entry, but the number is posted at the gate, and we just gave our name and site number and they opened the gate electronically with no delay. 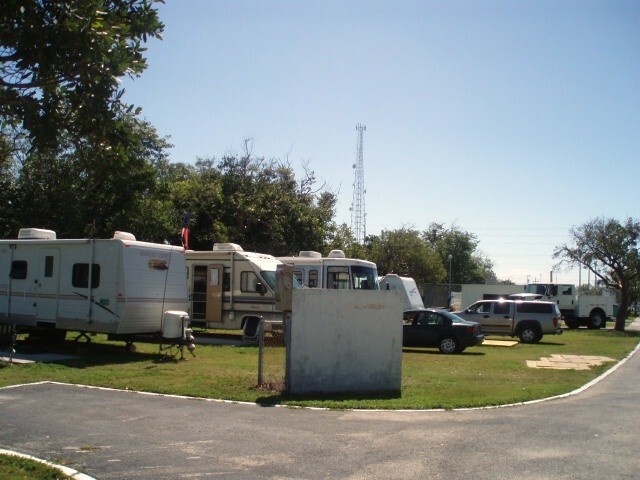 The site was plenty large for our 16' Scamp and Dakota pickup, plus our 9X12 screen room. We enjoyed the location and would definitely come back. We stayed here for 2 weeks in Feb-March 2016. We did call the number provided to us prior to our arrival, and Rick met us at the gate as arranged. He took us to our RV site and made sure we were settled, brought the paperwork to us, and answered all our questions. We were in RV site 4, which is one of the widest sites we have had anywhere. The other sites were narrower, but adequate for slides. If you book online from their website, ALL of the info you need is there, including the gate call number, the length/width of each RV site, dates available, etc. we had our 70# dog with us, and were given ample space to walk her. In fact, we were told we could take her anywhere on the RV side of the base, from the gate all the way to the water. Of course, you are expected to pick up after your dog. Never once in our 2 week stay did anyone approach us with any concerns. Perhaps there has been a change of command since the previous reviewers reported problems, but we couldn't have had a better experience. They do strictly enforce the curfew, but this wasn't a problem for us as we never stay out late anyway. The only drawback is that you currently have to call the gate number for entrance every time you come back in. I felt this was more of an inconvenience for the staff having to deal with taking the calls than for us. Also, you must have a self-contained unit as there are no facilities available. Again, not a problem for us. Since there are only 4 RV sites, this was a nice, quiet and peaceful stay overlooking the ocean. We would definitely stay again! 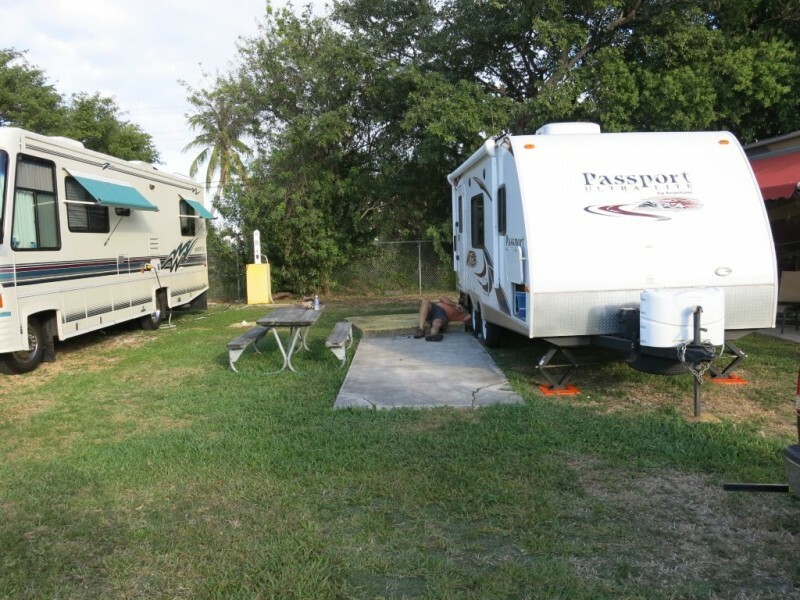 My husband and I visited the Marathon Cottages and RV Park, Marathon, FL, a day earlier than our reservation began in November 2015. We were very happy that the MWR liaison, Tom (I think that’s right) was able to accommodate us. 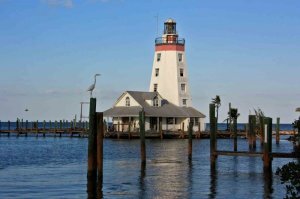 The most important change – coming soon – is that this USCG Station is planning to implement an electronic card system. Currently, there is a curfew of 10 p.m. Monday through Thursday and midnight on Friday, Saturday and Sunday nights. You must phone from the front gate to ask that the gate be opened or you will have to find somewhere else for the night. We didn’t know about this when we booked our reservation. The change means that in the future, guests will not be restricted as we were, though it turned out not to be the problem we thought it might be. Great place to stay. Staff friendly and helpful. Cable would have been a great addition. No showers but free laundry! Make sure to visit Sombrero Beach. Book online at: http://www.uscg.mil/BaseMiamiBeach/mwr/mwrMarathon.asp Skip Key West and stay on Marathon Key, cheaper snorkeling better water, cheaper parasailing, cheaper everything and more to do. Full hook ups and only 4 RV sites makes it nice. Wifi is included in the stay. There is no bathhouse but that is why you have an RV. 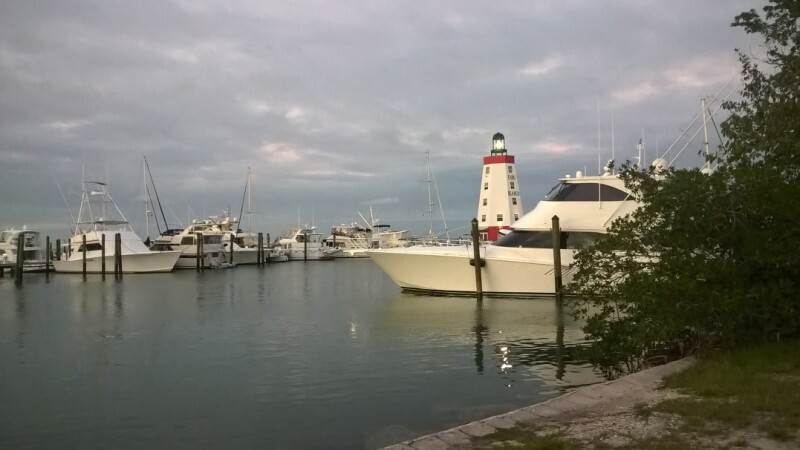 Rent a boat for almost half the price of Key West and there is clearer water. The police office (that pulled me over) gave me a tip to go to mile marker 61 and cross the street for snorkeling. One week in Key West and have had more fun in Marathon in two days for half the price. 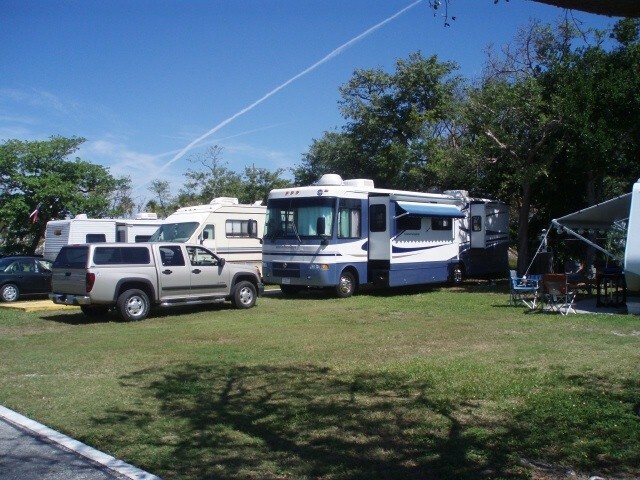 This was our second stay at this RV park. Last summer, construction was going on next door and lots of noise. This year the construction is over and a brand new Hyatt Place resort is in place. Very, very nice resort and an excellent restaurant right on the water. And the Super Boat races were held there on 5 July. We choose and got site 1. 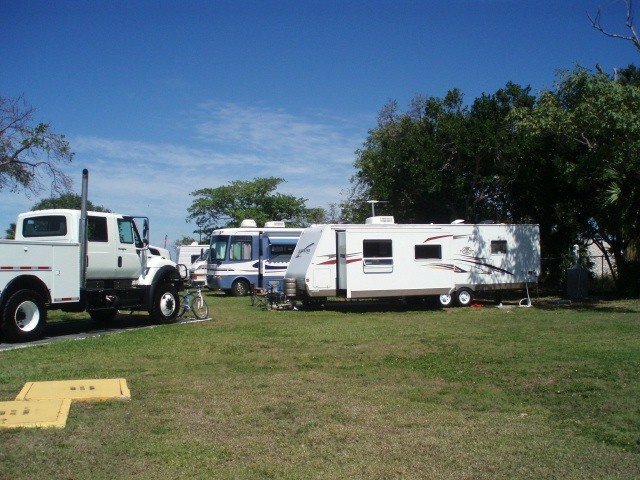 This site allows you a great water view and no other RV to look at. Sites 2,3 and 4 are close together but fortunately only one other RV was on site and it was two sites away. If 4 RV's showed up, site one would still be great but the rest would be very tight. Full hook ups. The water and power (50 amps) are at the rear of the site. The sewer connection is several feet in front. And yes the other sites have weird sewer connection locations. The place is extremely secure. You have to call by cell phone to get the main gate open. The duty officer was pleasant and I had no problems getting in. Leaving, the gate opens automatically. Hours of gate operation was 7AM to 10 PM Mon-Thur and 7 AM to 12 PM Fri-Sun. This is a busy coast guard station and the on duty crew sleeps on station. The security for me was a pretty good deal. I am a scuba diver and I could lay my tanks out with gear and not fear anyone taking them. The fence is a barbed wire type and it also made me feel secure. The Hyatt Place next door is a high end resort so I guest that is a good thing too for security. MWR was helpful but for the most part they are invisible. I did inquire about the boat rentals. The current requirement is a Florida Boater card which can be earned over the internet. And a short exam given by the MWR officer. Obviously, with so many RV'ers living out of state, this make renting a boat almost impossible. The boats are $95 per day and hours are 9AM to 4PM and you have to clean them up after each use. Best bet is to go down the street and get a boat rental all day for $100 dollars and use it from dawn to dusk. You are not allowed to launch anything from this station except the on base rental boats. The service members store their boats here but they too must take them off base to launch them. This is a terrific place for walking and biking. There is a walk/bike path all the way to the old 7 mile bridge and you can hike all the way out to Pigeon Key and back. I recommend that you do this late in the afternoon since the summer heat is brutal. AS for Diving, Marathon is equal distance to the best diving in the keys. Key largo is 40 miles east and Key West is 40 Miles west. Diving in Key Largo on the Spiegel Grove is a thrill as well as the several other great wrecks/ Marathon has the Thunderbolt and Busch wrecks. Both are spectacular. And Key West has the Vandenberg. One of the best wreck dives in the USA. And it is unusually quite here at the CGS. I will return again and again. Overall not a bad little Coast Guard MWR campground. The $30 rate per day is not bad for the keys. Although Sigsbee is cheaper. Sites are a little narrow for a motorhome with 4 slides. Water and electrical are on the top of a 4 foot cement pillar at the rear of the site. A large oak tree near the rear our our site (RV3) limited how far I could back in. I used almost 40 feet of water hose to reach the water faucet. Our neighbor's sewer connection is almost in our site and is about 6 feet from our patio. They are very strict here. EVERYTHING IS OFF LIMITS TO ANYONE IN THE RV SITES and they mean everything. This morning I walked the dogs, had a poop bag with me, to the RV gate entrance. It's about 400 feet from the RV sites, not near any building or equipment. Within minutes of getting back to our motorhome there was a knock at the door. It was the person from the MWR office telling me the commander here saw me walking our dogs and he was here to tell me NOT to leave the RV sites area again. Wow! I had no idea the road to the gate to get in and out here was OFF LIMITS. Getting in here is not easy either. When making the reservation and reading the reservation package there was NO mention that the RV gate is locked at all times. You are suppose to call ahead to get the gate open. They don't tell you that and don't provide the phone number either. You will not get that number until you get to the locked gate and find it posted on the EXIT gate. OK that's bad enough but when you pull into the entrance there is not enough room to park without you blocking one lane of the Overseas Highway. So while you are trying to find how to gain access you are in a very unsafe condition. I understand the need for security but this procedure needs to be told to you when making a reservation. After getting in here I was told I should have called before getting here. I told the guy I would have but no one told me that. BTW the number to call to open the gate is 305.743.1991. Overall it's OK here, but I get the feeling we are really not welcome here and they just tolerate us RVers. That's fine but We will NOT return here. We were in site #2 in a travel trailer. Only 4 sites so if you are sandwiched in between two huge class A's like we were then no view and cramped. Great value compared to civilian hotels but not a whole lot cheaper than the state parks (very hard to get into). There is a 10 pm deadline during the week and midnight on Fri & Sat to get back in the gate. You have to call a phone number at the gate each time to get back in so make sure you have your cell phone with you & it is charged! The hosts/caretakers in charge were friendly and helpful. Tiny installation. There was one free washer and dryer in a tiny shed next to the cottages. We found lots of active things to do but found the very busy Rt 1/Overseas Hwy to be annoying. Overall, a good place to stay and use as a base to explore from. I believe they were about to add a tiny store at the caretaker's location near the cottages. Rick from MWR called in the AM to make sure we were arriving then greeted us at the gate. He gave us the internet code, rules, showed us the laundry and told us about Sombrero Beach 2 miles away, white sand and picnic tables. Good launching point for kayaks. We were in site #1, had a nice view of the water. Very quiet here except for the construction next door 8am-4pm Monday-Friday. We talked to some of the guardsmen but for the most part did not see them much. Only saw the dog from a distance, never by the RV sites. Only RV 4 of the 7 days we were here so using the free laundry was no problem. Internet is OK most of the time, no TV with the antenna. 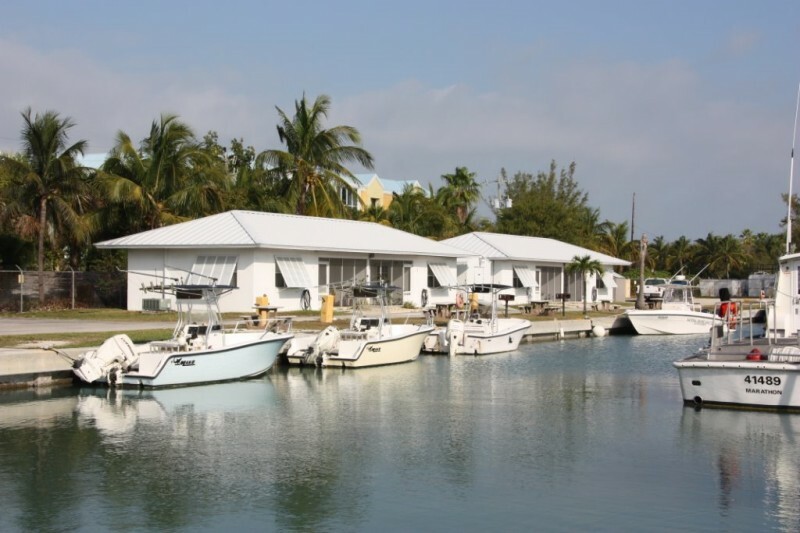 The rate is now $30 per day, a bit high for military, but the location is great if you want to explore the "Keys". The Mile Marker 48 sign is just past the gate - but look for the red & green markers at the gate -easy to spot. I initially did a review when we arrived on 6 Feb concerning issues with renting the boats. After staying 2 weeks at Marathon, I am posting some updates. When we arrived, we were greeted by one of the MWR folks and given a letter from 2005 that explained the rules; many of them were currently out of date. We hardly ever saw someone from MWR again, unless we hunted them down to ask a question. About half the campers received the internet codes when they arrived and half did not. 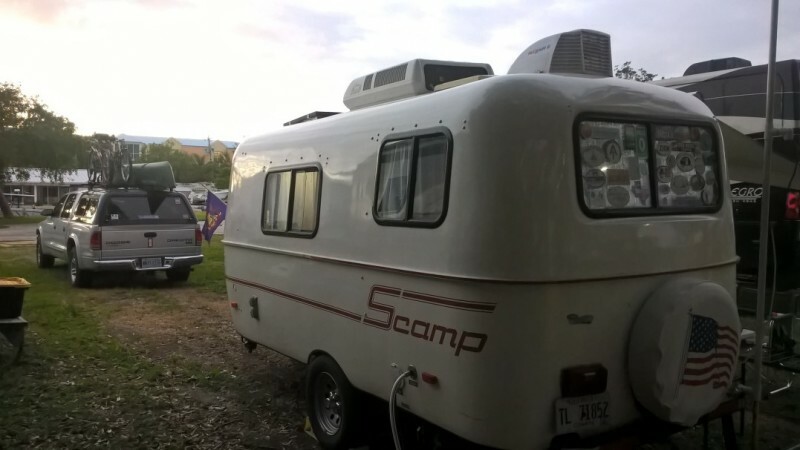 We had to get it from another camper and passed it on to at least one other camper. I learned from reading reviews on this site about the free laundry, but another camper went into town and paid $4 a load because they didn’t know. The facility has one large-capacity washer and dryer near the cottages and I never had to wait the two times I used them. The washer and dryer each take about 45 minutes to run through their cycles. The best thing we found about this campsite is the location. We towed a trailer, so it was easy for us to get around in our truck. We loved the close location to several State parks, especially Bahia Honda. For those who don’t have a seperate vehicle to get around, it isn’t a great place to stay since there isn’t any recreation available on the station. Our neighbors rode their bikes around, and said when they got tired the local taxi company would haul them and their bicycles back from anywhere in Marathon for $5.00. Yes, the dog Roscoe was allowed to roam. He’s friendly and I’m an animal lover, so I didn’t mind. When I saw him “dumping” in the camping area, I simply let one of the coastguardsmen know and asked them to please have someone police the area. As far as renting one of the boats, we never saw them leave the station. Here is an update we received on current rental policy in an email from Casey Malloy, the regional MWR director: “Required documentation: up until Dec 12, the only requirement to rent a boat was a specified online boat safety class. However, after the inspection the requirement is to attend a AUX (8 hour) boat safety class in person. This is the process we are currently addressing. As to the specific documentation, completion of the class should be signed by the local flotilla training POC. Again, we know that is a strain for our customers and that is why we are going forward to request a change to that requirement based on Florida Law and the lack of available classes. In addition, our plan (nothing is completed) to waive the Auxiliary course to anyone with a qual letter from their OINC certifying them as coxswains for small boats. For cutter men they have to present a Deck Watch Officer or coxswain certification. For both they have to be either assigned and/or no more than 3 years from their last underway assignment.” If you want to rent a boat, I suggest you contact them for the current rental information. 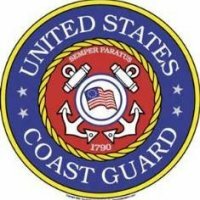 Give yourself plenty of time because most of the Coast Guard Auxilary courses are taught over a month-long period. Also, I don’t know if “the local training POC” in this case means the course has to be taught in the Florida Keys so you need to get clarification on this before wasting your time. If anyone has the answer, it would be much appreciated if you posted an update. OK location. Limited in walking area. Surrounding area primarily non-retail, non-tourist business in our opinion. No real amenities or facilities. Small RV site is all there is. NO access to any facilities (gym, bldg restrooms). No water access of any kind or boat, kayak, canoe launching. MWR rep greets on arrival; that is extent of involvement. Access in/out not a problem. With only 4 RV sites on one side of base and 4 cottages on other there isn't much activity. The young CoastGuardsmen were all polite. Really only negative is the Base not adhering to the published pet leash policy. Their station dog, Roscoe, was always loose without leash and peeing on RV wheels and dumping all over. Despite repeated comments to the young men outside and to #3 in charge maintenance chief, there was no interest, concern, or call to attention about the problem. Response was the master chief oic made base policy. Unsure of real meaning of that. I believe in everyone following all the rules. We are located here as I write this review. Reservations were easy. Download the pdf form and fill it out on your computer and send it in via email with you credit card information or you can fax. The reservation clerk is very good and will send you a receipt and confirmation when all is complete. This is a great location midway out on the Keys. It is nothing fancy but worth the price as everything else around is $100 a day plus. We have a reasonable space but may be a little tight for some. The concrete patios are cracked and need repair. The 30 and 50 amp power is stable and good. Water quality great and free wifi is the best I have found across the USA as very fast speed and easy to get on. The free laundry is a plus. The front gate is not manned but you have to a call box which rings the command center office and you tell them who you are and they open the gate. You also need to unhook your toad/car before getting here as the turn and gate entry is short and narrow. Getting out all you need to do is pull up to the gate and it will open. They have a great deal on renting boats for the day for $98 from 8AM to 5PM for about $95 for the day plus what fuel you use. You will need to prove you have taken and passed a Coast Guard Aux. training course before they let you have it. This is not a resort but beautiful view of the bay and quiet. RV1 space is closest and faces water on passenger’s side of rig. RV2 space is OK. RV3 space has a tree in the rear that limits backing up all the way. RV4 space is OK. RV5 space is OK. RV6 space is OK and has no one on drivers side but lots of grass. Lots of grass to walk dogs on leash. Local restaurants are plentiful within a few miles for all meals. Gas and diesel are same price as southern Florida but I still topped off coming out here in Homestead FL. J.B. left this review using the Directory software: - This is a great place to stay for a base camp! No frills but is secure, quiet, and convenient to explore Keys. We stayed 4 nights and very happy with location. Didn't look to do any rentals but were told of availability. No store but KMart close and other grocery stores. Great for visit to Keys. Very quiet and secure. Used as base camp and was able to leave and come back and not worry about rv. Must be totally self contained due to no bathrooms, showers etc. Very nice and received prompt replies to emails and reservation.